Railways Express is a tile-laying train game where you’re trying to connect each of the four cities on the map that match your color. 64 plastic locomotives (16 in each of the four player colors). 231 track tiles—these include straight tracks, curved tracks, and complex crossing tracks. 120 reroll cubes in each of the four player colors. 4 wooden dice—2 track dice and 2 terrain dice. 18 Service Bounty Cards for an optional way to play. 24 Railroad Operations Cards for an optional way to play. Each player has four cities on the map in his or her color, and one of those cities is considered the Home City for that player. (Monterrey for Blue, Los Angeles for Yellow, Minneapolis for Red, and Montreal for Purple.) Each player places a train in their Home City, and then places two reroll cubes in their other three cities. Then each player places one reroll cube in each of the “neutral” gray cities on the map, and takes two of the remaining reroll cubes to start the game. Designate a start player. 1. Roll the four dice and split them however you choose. 2. Build track tiles on the map based on the roll. The track dice have two sides with two straight tracks showing, two sides with two curved tracks, and two sides with one of each. 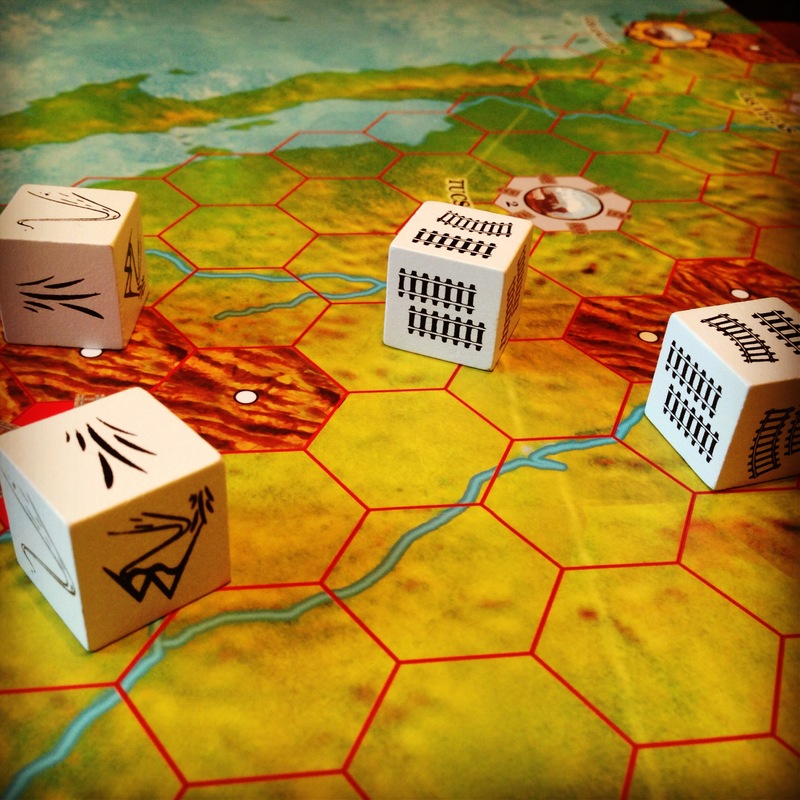 And the terrain dice have two sides with grassland, one side with water, one side with mountains, and two sides with all three terrains, which acts as a wild. So you roll all four dice, and the pair them up—one terrain die with one track die. Then you place up to four track tiles following the terrain and track you rolled. You can split the placement however you’d like. So if you roll a mountain and a grassland, you could place one mountain track, two grasslands, and then the other mountain track. Your first track played in the game must be from your Home City, and each subsequent placement has to either come off of a previously placed track tile or a city of your color that you’ve previously connected to. Because of where you are on the board, and the terrain and track you roll, it’s possible you won’t be able to place any track down at all—or will only be able to place fewer than four tracks. That’s here the reroll cubes come in. You can turn in any reroll cube you’ve collected to reroll one or two of the four dice. You care free to use more than one reroll cube on a turn if necessary. You can choose the order of cities you visit once you leave your Home City. Once you do connect to one of your Home Cities, you get to collect the two reroll cubes on it. No player can ever connect to a colored city of another player. You are free to connect into and out of any of the gray cities on the board, and if you do, you get your reroll cube on that city. Because the spaces are hexagons, up to three players can connect to each of those gray cities, but the fourth player is just out of luck. But the point of the game isn’t to connect to the most cities—it’s to connect your four cities. So don’t get distracted. Once someone does connect those four cities, each player who hasn’t had an equal number of turns gets one final turn. Ties are broken by reroll cubes. The game comes with two decks that give you more options for play. 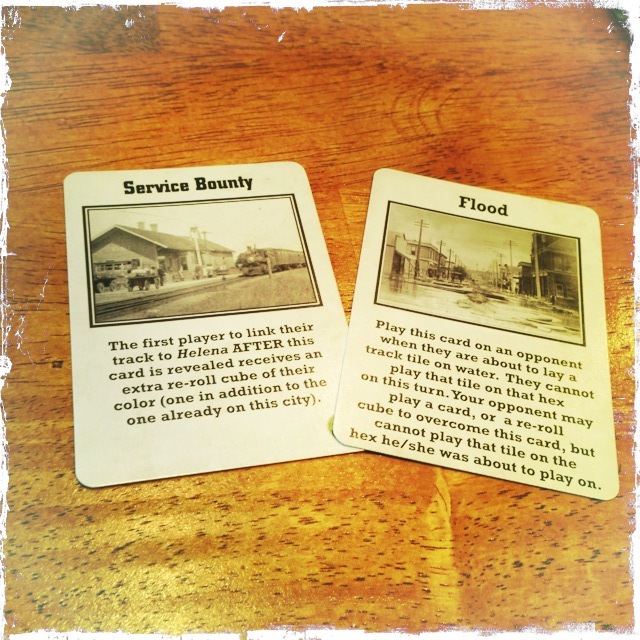 The Service Bounty Deck consists of 18 cards that are identical, other than the city named on the card—there’s a card for each of the gray cities on the board. You shuffle the deck at the beginning of the game and deal four face-up. If someone connects to one of those cities while the card is visible, he or she gets an extra reroll cube, and you discard that Bounty and draw a new one so there are always four visible bounties. The Railroad Operations Deck are various cards with various powers, that include being able to play on any terrain without having to roll a terrain die, a free track tile placement on a certain terrain, and cards that you play on others that keep that player from playing on a certain terrain type. You get to draw a card when you connect to a gray city (not one of your own). Jeremiah—So let’s talk about the components. Everything was well-made—the cards, the board, etc. There were some choices that I wouldn’t necessarily have made (wooden dice, plastic trains seemed backwards to me), but nothing that ruins the game. The only quirky part about the components were areas of the board that were or were not considered to be water hexes. The rules say that only the bright blue hexes are water not the pale blue, and sometimes it was really hard to define what those were. Oh, and did we mention, the board is HUGE!? Firestone—Yeah, unless it’s something like Twilight Imperium, I almost always prefer wooden pieces to plastic, but they’re mostly good. (The wooden dice are just okay.) I agree that those ambiguous water spaces are the board are annoying, though it’s easy enough to make a house-rule decision. Publishers: If a space isn’t a water space, don’t put water in it! No one will be angry if you err on the side of clarity! Firestone—I was pleasantly surprised to see that the game was for ages 7 and up. And it proved to be true! We even played with my 5-year-old, and with a little help, he was doing well. We’d talk about how to split his dice, and then he would put them down where he wanted to go. The age requirements might be my favorite thing about this game. Jeremiah—Yeah, I was really glad that even on the box it says the game is for ages 7 and up. Most games I play with my kids (5 & 7) have an age rating of 8, 10, 12, 13 etc. and up. 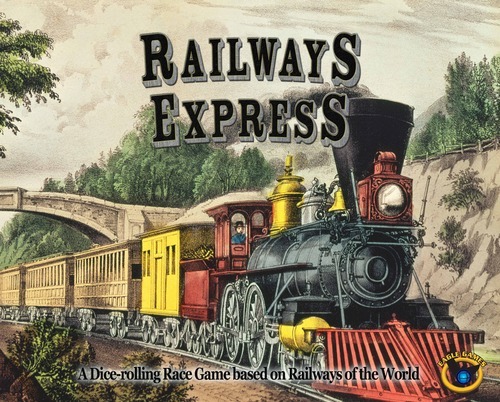 Railways Express is a great, introductory tile placement game, and is really for just about any age of gamer! Jeremiah—I really enjoyed that this was SO easy to learn, but it didn’t feel like an easy game to play. Which is to say that I felt like there were some weighty decision to make, concerning how to spend your re-roll cubes, which path to take and so on, but the mechanics were pretty light weight and uncumbersome. Firestone—I felt it was kind of decision-light, but that just means it’s a good family game and not a good gamers’ game. I like family games, so it’s not really a dig. Jeremiah—While there are some decent decision making moments, the game is really driven by the dice. For “certain people” *cough cough* Scott *cough* that can be a major downside. But dice-rollers have a certain appeal for the casual player, and this Railways Express is no exception to that. This will be one that I pull out for casual players, or family game nights for sure. Making the right decisions can definitely give you a great advantage, but there aren’t so many decisions to be made that a casual, or younger player will be gripped with analysis paralysis. Firestone—Since when do I not like dice?! Oh yeah…since always. 🙂 Look, if you roll better in this game, you will do better than those who don’t. Period. Again, in a family game that’s fine. 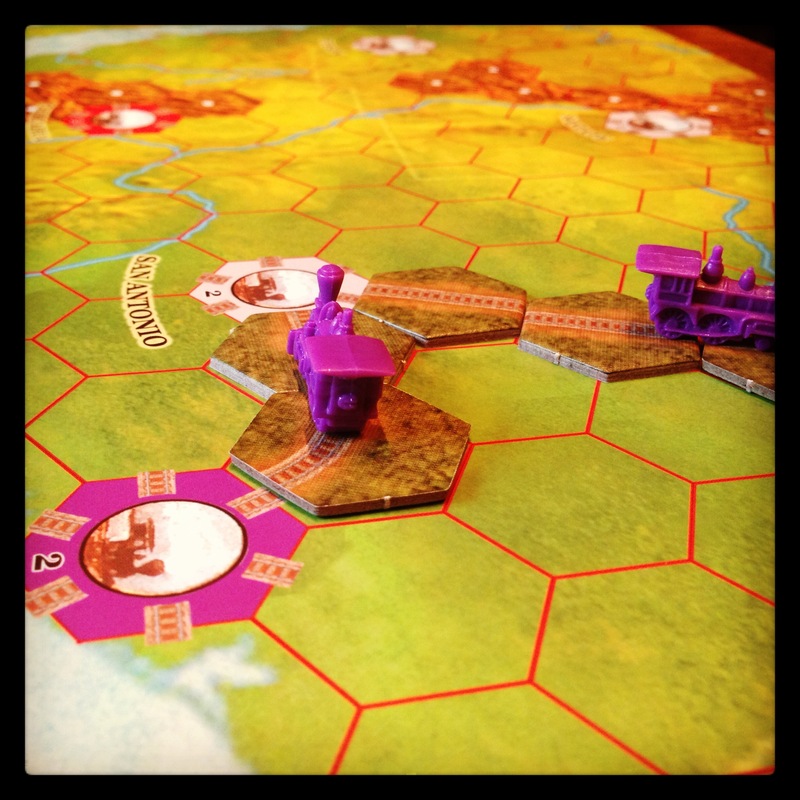 Firestone Final Thoughts—I’ve not played any of the Railways of the World games, but as an “express” version of anything, this does what it’s supposed to. It strips down play, and is a great introduction to the concept of building tracks on the map. As far as I’m concerned, this was the very, very first step in introducing my 5-year-old to Age Of Steam. If you’re playing with gamers, keep it on the shelf, but when it’s with family or nongamers, put Railways Express on the table. Jeremiah Final Thoughts—Railways Express is exactly what Eagle Games says it is. It’s an express, or streamlined version of their hit title Railways of the World. It plays fast—an hour max, and probably faster with experienced players—which could definitely earn it a spot as a solid filler game, although that would seem weird because it’s so HUGE. If you’re looking for a quick-playing game, especially with casual players or a game for your family game night, you should definitely put this game on the table! Thanks for reading! And if you’d prefer watching, just click on the vid below! And please subscribe to our YouTube channel while you’re at it!